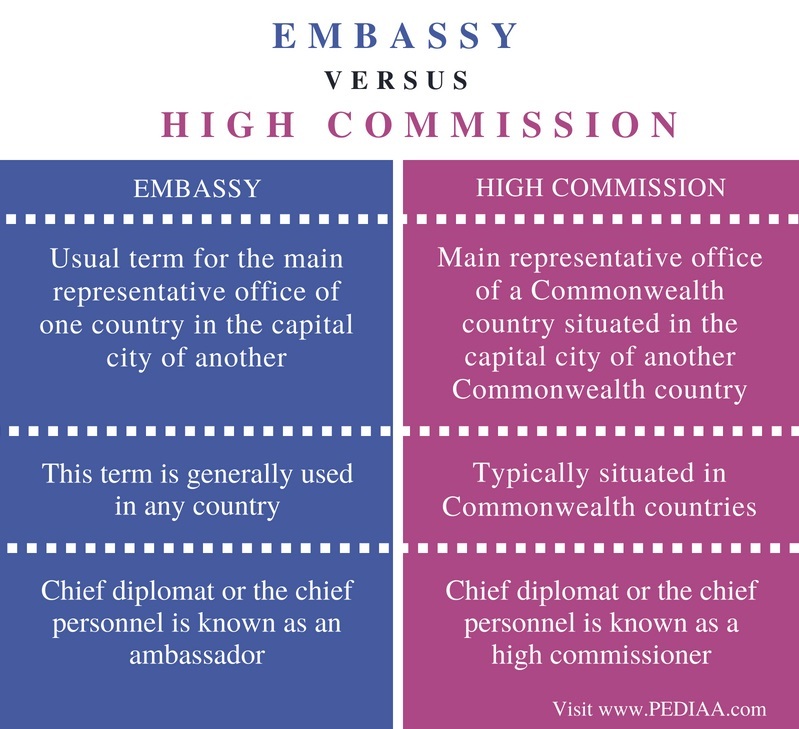 The main difference between embassy and high commission is that an embassy generally refers to the diplomatic mission of a country in the host country whereas a high commission, specifically, refers to the diplomatic mission of a Commonwealth country in another Commonwealth country. Diplomacy, in brief, is the manner of maintaining diplomatic or foreign relations with the governments of states in the international stage. ‘Embassy’ is the general term used to denote these diplomatic missions of countries. Hence, there is no standard difference between embassy and high commission (and consulate) with regard to their responsibilities since both these refer to diplomatic missions of countries/states in the international stage. The responsibilities of these diplomatic missions include representing the home state in the host state, protecting its citizens in the foreign country, negotiating with the host country on different matters, and fostering friendly relations with the host state and other states in the international stage. A diplomatic mission, also sometimes referred to as foreign mission, is a group of diplomatic representatives from one state or an organization present in another state to represent the sending state/ organization officially in the receiving state. Therefore, a permanent diplomatic mission between countries is generally known as an ‘embassy’. In other words, an embassy represents the state’s foreign policy and domestic policy, or simply the government of the state in the host state. Thus, it carries out the missions of the home country/state via transmitting the messages of the home state to the host state and vice versa. The chief responsible personnel who work on these diplomatic missions is known as “Ambassador”. Thus, an embassy refers to the main office of these diplomats of the diplomatic mission of the home country to the host country. This is, therefore, necessarily situated in the capital of the host country. Offices that are situated not in the capital country carry out minor diplomatic missions, and are known as ‘consulates’. Thus, a consulate is a lower level representative office, usually located outside the capital city. This is headed by a Consul-General. However, note that the Embassy of the State of Vatican is known by the name “Nunciature”. 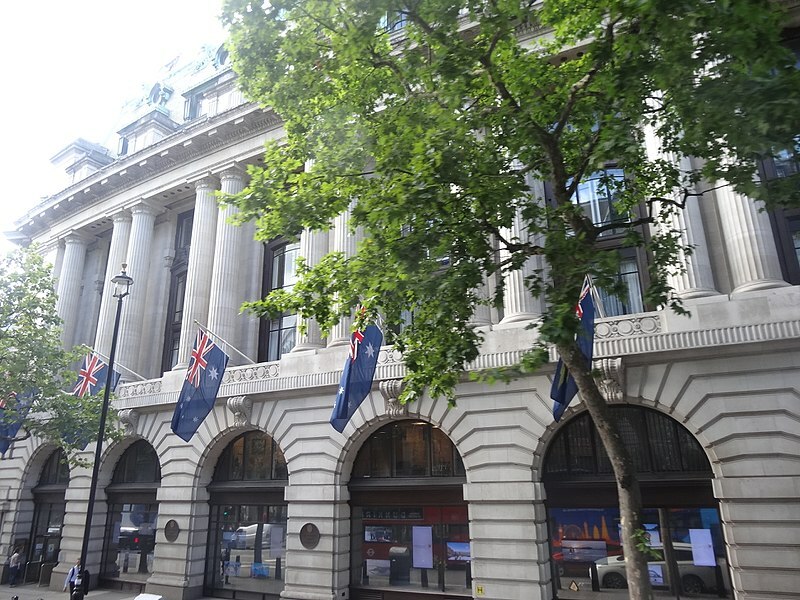 High commission is the term used specifically by the Commonwealth countries to describe the diplomatic mission of Commonwealth countries in another Commonwealth country. In other words, high commission refers to the embassy of a Commonwealth country in another Commonwealth country. Commonwealth countries refer to the 53 nations that belong to the Commonwealth. The main responsibility of a high commission is to undertake the mission of one commonwealth state in another commonwealth state, similar to an embassy. The chief personnel in a high commission is the high commissioner. Therefore, the US, which is not a member of the Commonwealth, typically has only embassies in other countries. But the embassies of India and Sri Lanka in each other will be known as High Commissions since both are member states of the Commonwealth. At the same time, the embassies of both these in the US will be known as Embassies. Both are diplomatic missions consisting of ambassadors of the specific state to the host state. The embassy is the general term used to refer to these diplomatic missions. 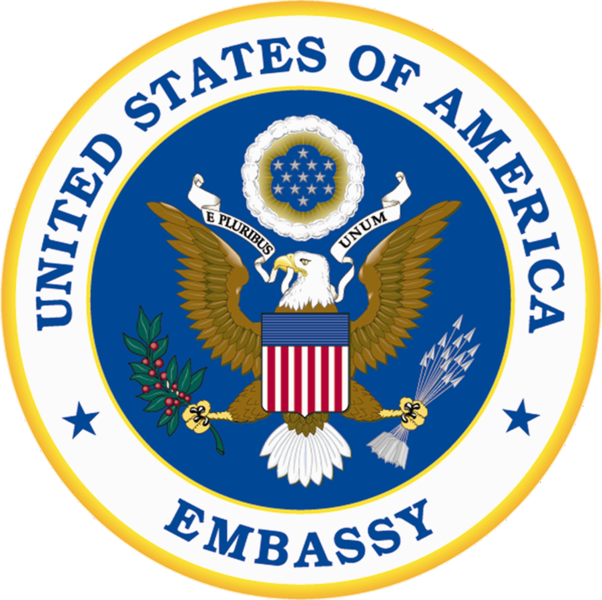 Embassy is the usual term for the main representative office of one country in the capital city of another. In contrast, High Commission refers to the main representative office of a Commonwealth country situated in the capital city of another Commonwealth country. A High Commission is typically situated in Commonwealth countries (the 53 members of the Commonwealth). In contrast, the term embassy is generally used by any country, specifically by countries that do not belong to the Commonwealth. Diplomatic missions are essential for a state to interact with the international stage. They also denote the foreign policy of the state in the host state. Both embassy and high commission refer to the official residence of these diplomatic missions. However, the difference between embassy and high commission depends on the usage. Therefore, the embassy is generally used by any country whereas high commission is used by Commonwealth countries. 1.“ Roles and Responsibilities of Embassies and Other Representative Offices.” Department of Foreign Affairs and Trade, 24 Jan. 2013, Available here. 2. Kingston, Si. “What Is the Role of an Embassy?” Synonym, 4 Oct. 2017, Available here. 3. “High Commissioner (Commonwealth).” Wikipedia, Wikimedia Foundation, 22 Aug. 2018, Available here.